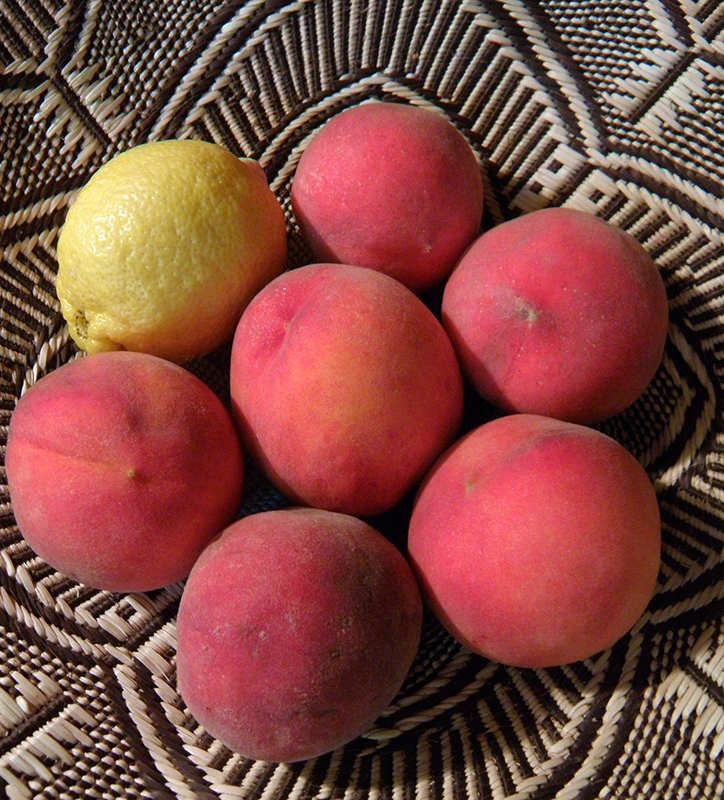 Are you baffled by recipes that call for 6 peaches or other fruits? I am, especially when the recipe comes from another country. How big are these fruits, and how much does each one weigh? Are our fruits bigger or smaller than theirs? Does the size of the peach stone matter? If I guess will the recipe come out right? Or wrong? In most recent experience…wrong. But fear not, cobblers aren’t rocket science (like pies and yeast breads are), so for this recipe FAIL there is redemption. I started with 2 lbs. 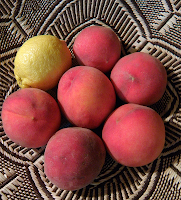 of fruit, which I thought was generous for 6 peaches. 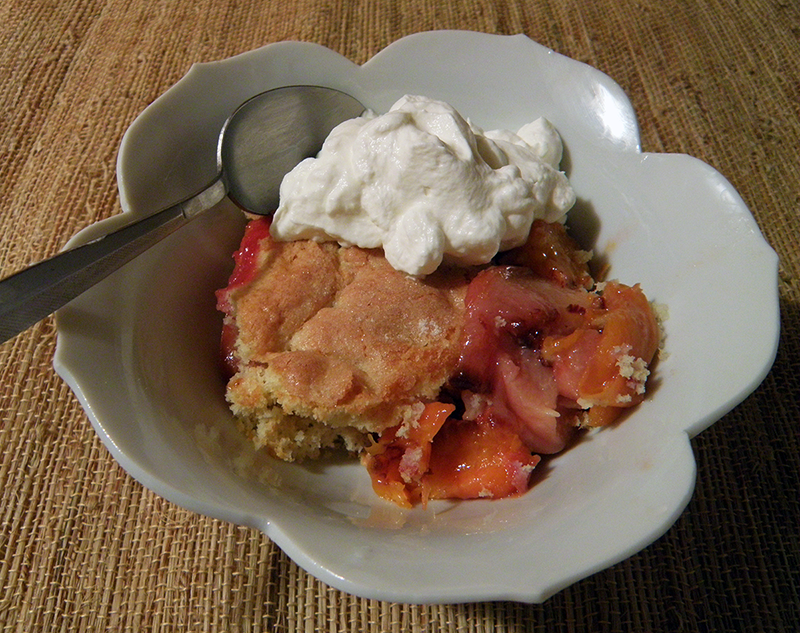 However, the peaches were overwhelmed by the fluffy cobbler topping. And so I increased my guess-timated amount of peaches to 3 lbs. Also, more liquid in the peach layer seemed desirable, so I mimicked Sherried Nectarine Crumble, also from the Crumbles & Cobblers cookbook, and added 3 tablespoons of sherry to replace the ½ tsp. almond or vanilla extract. You could choose to add water, apricot nectar, or even some bourbon instead. Next, I had a problem with the superfine sugar sprinkled on top. Instead of looking cutely sparkly like the photo in Crumbles & Cobblers, it made the top look flat and shiny. Again, our US superfine sugar could be different than that in the UK. Or, it could be user error in sprinkling. In any case, I substituted In the Raw turbinado sugar for the superfine topping for a more rough-grained sparkly surface. Practice makes perfect in learning the technique for spooning on the topping. Use a small soup spoon to add it loosely in somewhat equal blobs without smoothing it. It sounds simple, but is not, like so many things in life. I didn’t peel the peaches, as suggested, but you might want to. I also reduced the amount of sugar in the peaches layer by half. Next time I’ll experiment with whole wheat or rice flour and evaporated cane juice (raw sugar). Feel free to make other adjustments in the recipe as you see fit. 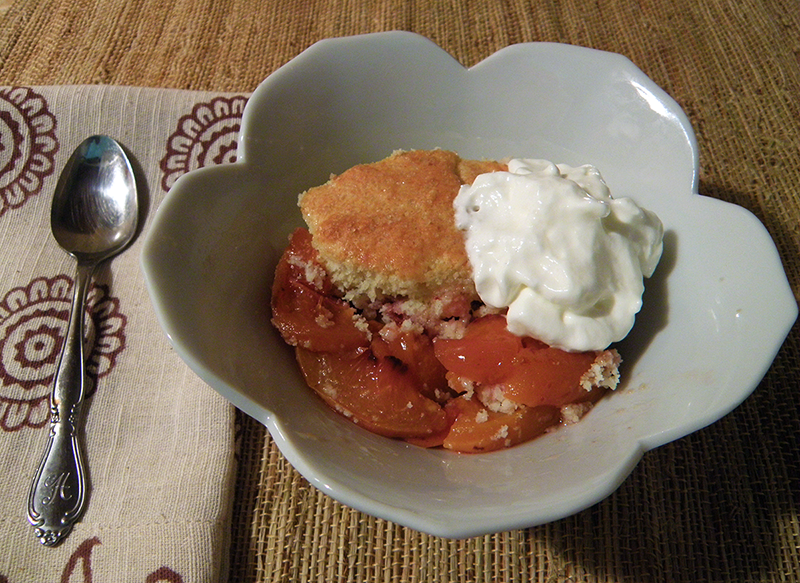 Slice peaches and remove pits (you can peel them if you prefer), and layer them in an 8” x 12” ovenproof dish. Add 2 tbsp. sugar, lemon juice, cornstarch, and sherry. Toss with hands to coat peaches evenly. 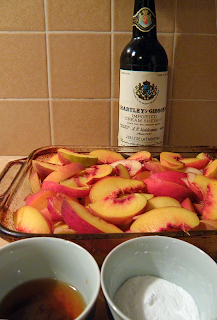 Bake peaches in preheated oven for 25 minutes. Dice butter into ¼ - ½ inch cubes. Store in refrigerator till needed. Sift the flour, ¼ cup + 2 tbsp. superfine sugar, baking powder, and salt into a bowl. Rub in the chilled diced butter with your fingertips till mixture resembles fine breadcrumbs. Beat the egg in a separate bowl. Mix in 5 tbsp. milk. With a fork, combine egg mixture with butter mixture until a soft, sticky dough forms. If dough seems dry, stir in extra 1 tbsp. milk. Remove peaches from oven and reduce oven temperature to 400 degrees F. Flatten peaches slightly with back of spoon or potato masher to make an even layer. Drop spoonfuls of cobbler topping over surface of peaches without smoothing; the topping will spread as it cooks (a small soup spoon works well for this). Sprinkle top with turbinado sugar. Return to oven and bake an additional 15 minutes, until topping is golden brown and firm. Serve hot or at room temperature. Garnish with whipped cream or ice cream, if desired.